We will have a great selection of wines in Hakuba this year. 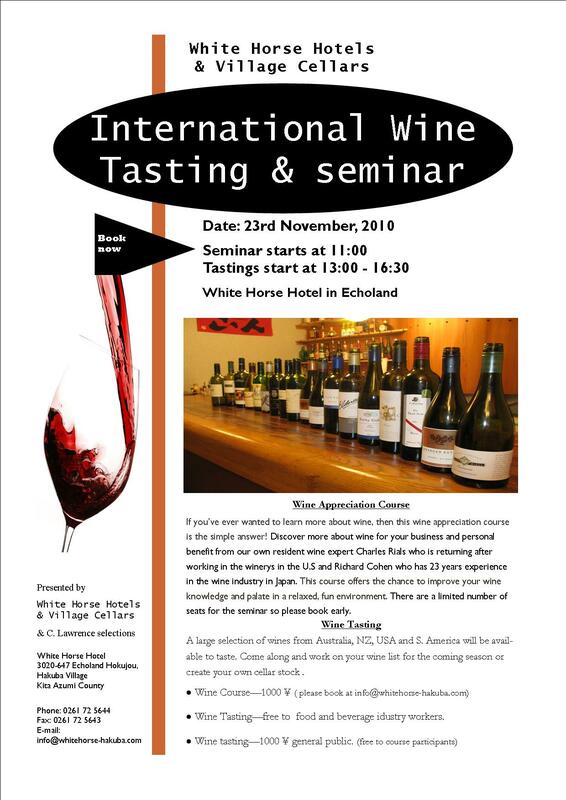 If you are in or around Hakuba on the 23rd of November we will have our annual wine tasting and this time we have included a wine appreciation seminar. Lots of wines from Oz, NZ, USA and South America. A great chance to learn a little more and taste a lot. I think it is a good thing for all the restaurants in Hakuba to increase their knowledge of wines so that we can all offer a better experience for our patrons. (Or is it just another excuse to drink?) Either way it should be a fun day. This entry was posted in Food, Hakuba, Hakuba Hotels and tagged accommodation, Hakuba, hotels, Japanese food, restaurants, wine. Bookmark the permalink.